The cornerstone of the Providence Collection is quality, and this chandelier is no exception. Combining a classic brushed nickel finish and posh styling, you will find no better way to highlight the charm of your home. With the superb craftsmanship and affordable price this fixture is sure to tastefully indulge your extravagant side. Traditional details and graceful lines provide modern elegance to any interior. 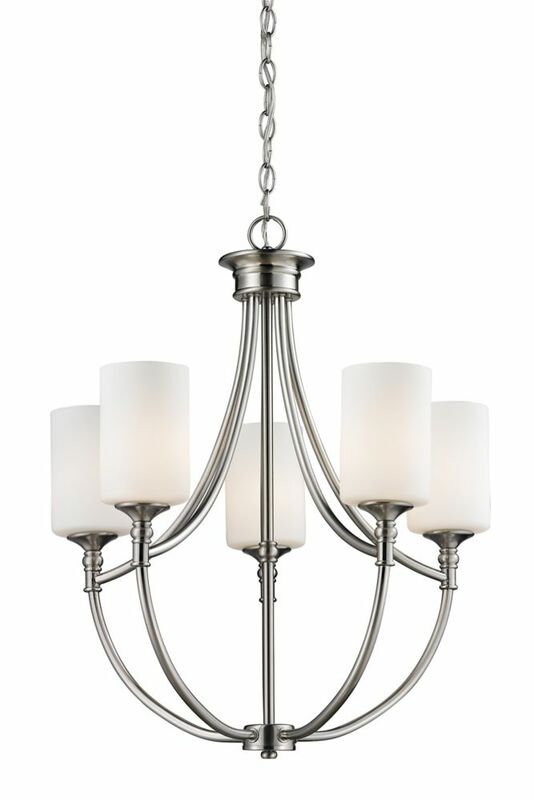 The Classic five-light chandelier features etched glass shades with a Brushed Nickel finish. A beautiful enhancement to dining areas in your home. Five-light chandelier from Gather possesses a smart simplicity to complement today's home. Brushed Nickel metal arms descend downwards and curve sharply to prop white etched glass shades. Etched glass add distinction and provide pleasing illumination to your room. Coordinating fixtures from this collection let you decorate an entire home with confidence and style. 5-Light Brushed Nickel Chandelier with Matte Opal Glass - 20 inch This chandelier will update your home with its eye-catching design. Featuring a brushed nickel finish and matte opal shade(s), this fixture will accommodate a variety of dicor styles. With its easy installation and low upkeep requirements, this chandelier will not disappoint.